Whether you want to look Christmasy for your Christmas dinner, cook and bake in true Christmas aprons or give aprons as gifts, I’ve found a perfect Christmas gift / tutorial for you! 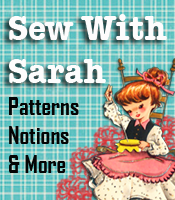 Phyllis Dobbs has a tutorial ready for you to begin sewing that perfect Christmas apron. 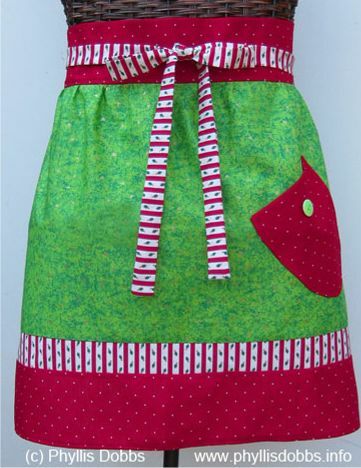 Check out this snazzy apron, then dig into YOUR fabric stash for Christmas fabrics. Thank you Phyllis for the super cute apron — think I’ll dig into my fabric stash as well. If you’d like to dress up some of those aprons made from jeans, you can do the same thing by adding Christmasy trims, ties and ruffles. The jeans aprons are especially easy and quick to make. I LOVE aprons — there are so many cute styles, and most are easy and quick to make.